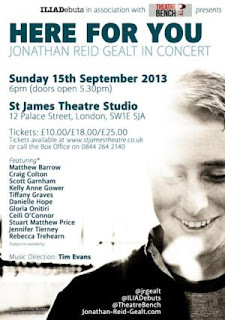 As part of the St James' Studio Cabaret Weekends, Jonathan Reid Gealt will be in concert showcasing his new album "Here For You - Ballads for Broadway Impact" on Sunday 15th September. The concert will include songs from his new album as well as "Thirteen Stories Down" and exclusives from his new musical "Dust and Shadow" performed by Matthew Barrow, Craig Colton, Scott Garnham, Kelly Anne Gower, Tiffany Graves, Danielle Hope, Stuart Matthew Price, Ceili O'Connor, Gloria Onitiri, Jennifer Tierney and Rebecca Trehearn with more to be announced. 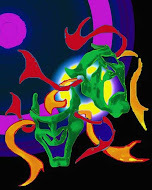 The concert starts at 6:00 pm and tickets (£10.00/£18.00/£25.00) are available at www.stjamestheatre.co.uk or call the Box Office on 0844 264 2140.